Megapixel: The Canon EOS 7D Mark II is built with more megapixel as compared to Fujifilm X-T1, so the 7D Mark II is capable of producing high-resolution, well-detailed still imagery and HD videos. Bigger Sensor Size: The BIT large sensor size of Fujifilm X-T1 makes it capable to acquire more light while shooting images, But does the result will show significant difference compared to 7D Mk II is still a question until we see image comparison. The NO-OLPF benefit – The Fujifilm X-T1 is designed with a randomized pixel pattern to eliminate the need of an optical low-pass filter whereas Canon EOS 7D Mark II includes an optical low-pass filter. Due to the absence of low pass filter Theoretically the images produced by Fujifilm X-T1 will be more clear and will have a better depth of color when compared with the images produced by Canon EOS 7D Mark II at 100%. More AF Points: Canon EOS 7D Mark II Fast Hybrid AF system utilizes altogether 65 AF points but Fujifilm X-T1 offers just 49 AF points. So, it is clear that Canon EOS 7D Mark II will do fast and accurate focusing than Fujifilm X-T1. Better Shutter Range: Canon EOS 7D Mark II features a shutter range of 30 – 1/8000 whereas Fujifilm X-T1 features shutter range of 30- 1/400. With a better shutter range Canon EOS 7D Mark II delivers incredibly sharp and crisp images in comparison to Fujifilm X-T1. Top Continuous shooting speed: Canon EOS 7D Mark II features fast shooting speed of 10fps and Fujifilm X-T1 offers the top continuous speed of 8fps. Battery Life (CIPA): With Canon EOS 7D Mark II 800 shots can be taken in one battery cycle and on the other hand Fujifilm X-T1 battery rating is 350 shots. (According to CIPA). Dimensions: Fujifilm X-T1 is smaller Canon EOS 7D Mark II so it is more handy to use. Weight: Fujifilm X-T1 is almost half in weight as compared to Canon EOS 7D Mark II. Image analysis – We are not able to notice any major difference in the image quality of both the camera. But yes Canon is showing bit better images with less noise. This comparison is stupid. How can you compare 2 years old X-T1 with a new Canon. 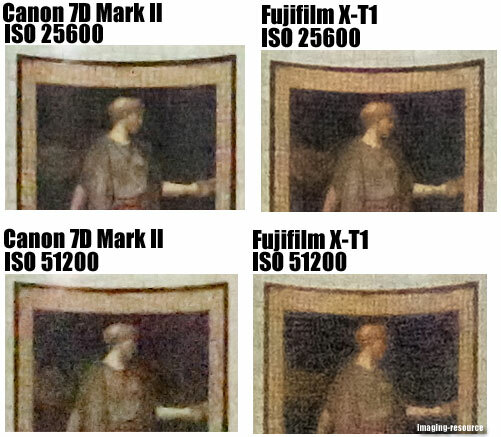 Everybody knows Fuji does better images than even FF 5D Mark III that costs 3 times more incl. lenses, and it’s 2 x bigger and 2 x heavier. These are totally two different cams in technology. You can’t compare them on paper, but in real life situation, where x-T1 wins. Either if I do not agree with the previous comment, not because you would had some difficulties to find a XT1 2 years ago but because this type of choice must be done by some photographers, I am to say the least a bit puzzled by the way this comparison has been done. The coloring of the cells in the table do not goes with to the comment see the weight and size criteria. If you correct the count comes from 5:4 to 4:6. There is not comparison on the image quality in the commonly used ISO range Sure 25600 ISO and more is handy, but it is a fringe case. When last did you shot at more the 6400 ISO ? 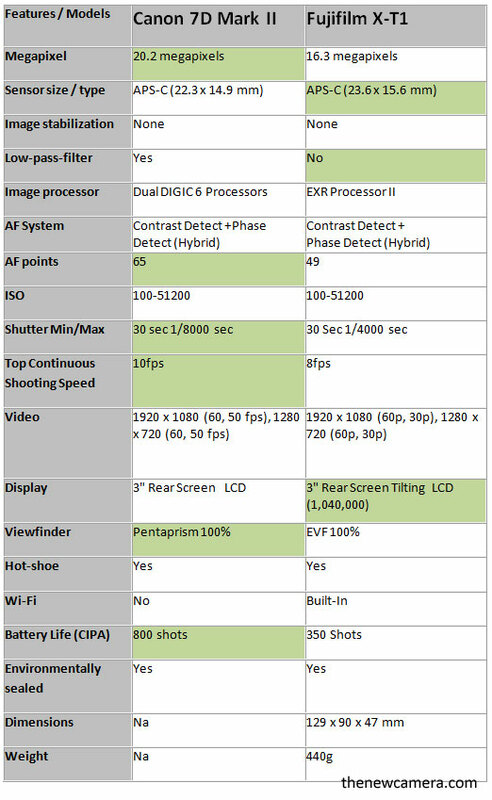 I can clearly see that Canon core specification is better than of Fuji X-T1, yes Fuji is old so it doesn’t mean we should have some sympathy for it. The writer clearly indicate that you get better images with Canon is you need faster shutter speed…. These website do excellent job to bring out truth to the public without 10 page long reviews…. so we should encourage them to publish more comparison like this. You are completely wrong here. Well detailed real life test and comparison is more valid, than selected fragments of dry test on the paper. Massive migration of Canon users to another systems speaks a lot. For a more than decade, Canon can not compete with other top players in still photography. For a such a long time Canon have not came with any decent improvement in this field. They do decent video gear, and that’s it. But, this is not my field of expertise.